Are you ready for some football? 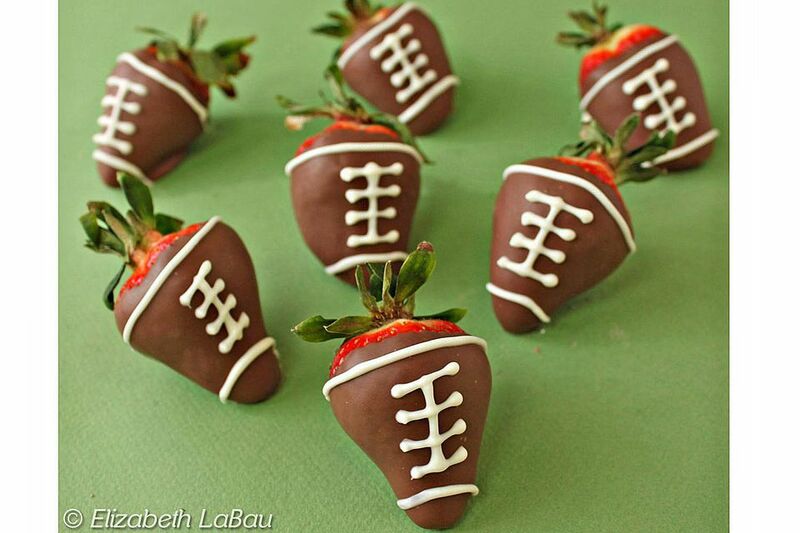 How about two dozen adorable strawberry footballs? This easy recipe is perfect for your next football party. Everyone will love these chocolate-dipped strawberries decorated to look like miniature footballs, and you'll love how fast and simple they are to make. Wash the strawberries and pat them dry. Make sure they're truly dry and don't have any wet patches, otherwise you'll have trouble dipping them. Melt the chocolate candy coating in the microwave, stirring after every 30 seconds until it is smooth and fluid. If you are using chopped chocolate, you should either temper it following these directions, or be prepared to keep your strawberries in the refrigerator until you are ready to serve them. Chocolate that is melted but not tempered can get soft and streaky at room temperature, so it should always be kept refrigerated. Repeat the process until all of the strawberries are covered with chocolate. Refrigerate the tray until the chocolate is set, for about 15 minutes. While you're waiting for the chocolate to harden, melt the white chocolate. Pour it into a paper cone or plastic baggie with a small hole cut in the corner. Draw a white chocolate line around the top and bottom of a strawberry, then add the white "laces" in the middle to make it look like a football. Repeat until all of the strawberries are decorated. Let the white chocolate harden completely. Strawberry footballs are best eaten the day they are made.